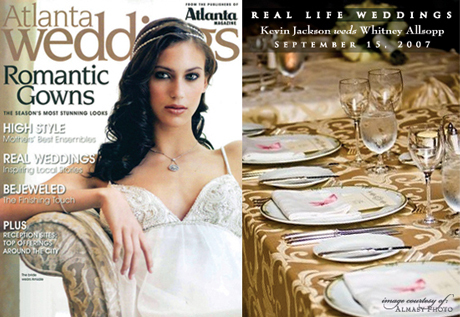 La Belle Fête had the pleasure of working with bride Whitney Allsopp and groom Kevin Jackson, whose 2007 wedding was featured in the fall 2008 issue of Atlanta Weddings. We worked with Whitney, Kevin and Whitney's mother to create an extensive, 14-page, satin ribbon embellished save-the-date booklet featuring detailed information on Atlanta attractions for out-of-town guests. We also worked closely with Whitney to create one-of-a-kind, custom letterpress invitations and provided calligraphy for the envelopes, designed and produced coordinating ceremony programs and menu cards (shown left), all featuring their custom monogram we created. It was a pleasure to work with everyone involved to create such beautiful pieces, and a real treat to see our name in print for simply doing what we love to do!